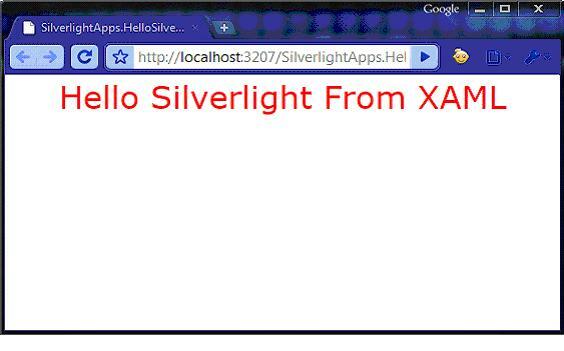 Once you build your project, it will create the XAP file (in our case, it is: SilverlightApps.HelloSilverlight.xap) and put it into the ClientBin directory of the web project. When the page loads it will pickup from the same location as the source you specified inside the aspx/html page. };// Add the textblock instance as the children of the "LayoutRoot"
You will find Grid, Canvas, StackPanel and Border as most useful panel while you start working with them in your Silverlight application. Let us discuss about those in depth. The Grid layout panel is the most useful panel you ever use. This is the default panel inserted inside every xaml when you create a UserControl. 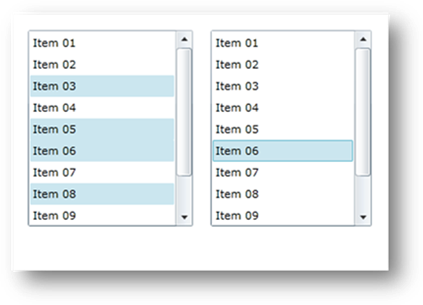 When we created our first Silverlight example or even the first UserControl, you noticed that there was a Grid panel named “LayoutRoot” where we created Rows and Column definitions to place our control to create the Employee View. The Grid layout control allows you to define the Grid structure to place individual elements as Rows & Column structure in Matrix format. Once you divide your Grid panel in Rows and Columns you can place your element in the appropriate cell by using Grid.Row or Grid.Column property. 1. Create a UserControl named “GridPanelDemo” in our Silverlight Application. 2. Open the GridPanelDemo.xaml file. You will see that there is a Grid named “LayoutRoot” inside your UserControl. 4. This will divide your Grid in three rows and three columns of equal height and equal width. c. Automatic Value (like: “Auto”, means the height or width of the Row or Column will resize automatically as per the size of content of the respective Row or Column. 8. Also, you can use Grid.RowSpan and Grid.ColumnSpan properties to span your rows and columns. If you are familiar with HTML table tag & properties you can easily understand it properly. If we use the above code, it will span the 0th Row and 0th Column to two Rows & Columns. This is nothing but merging rows and columns of Grid Layout. 9. Now, open the MainPage.xaml.cs file & in the constructor create the instance of the GridPanelDemo usercontrol and add it as the child of the LayoutRoot i.e. Grid. 10. 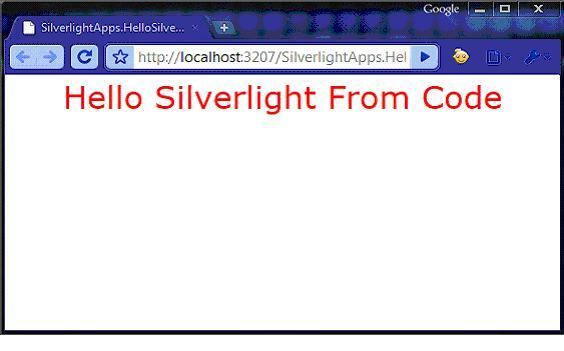 Run your Silverlight application. You will see that, the TextBlocks are arranged in the Page in matrix manner. You will find this useful when you have to position your controls in proper way, in proper Row & Column. Note that, if you don’t create rows or columns and place multiple controls inside your naked Grid, you will see them overlapping each other. So, if you are using Grid be sure that you splitted your Grid in proper rows and columns. Canvas is the simplest layout available in Silverlight. It is very easy to understand and using this you can place any content any where inside the canvas. Not only this, you can also layered your application and by layering you can put your content front or back of any other control. You can think Canvas as a HTML div Tag, where you can put your content in specific location by providing absolute left and top position. Have a look into the below image to get a brief idea on the same. Lets think there are two Rectangles placed inside the Canvas as mentioned in the above figure. The first Rectangle (Blue one) is placed at the (10, 10) position. This is the coordinate location of your first Rectangle. First one stands for “Left” and second one stands for “Top”. So, What is the coordinate position of the second Rectangle (Orange one)? Exactly, it is Left =50 and Top = 30 i.e. (50, 30). I think it is the right time to go for writing a sample code to create the above canvas with two Rectangles inside it. I am pretty much confident that, you have now a good confidence on the Canvas positioning. Let us create a new UserControl named “CanvasPanelDemo” and then we will create two Rectangles in it and will place it in proper location. 1. Create a UserControl named “CanvasPanelDemo” in our Silverlight Application. 2. Open the CanvasPanelDemo.xaml file. You will see that there is a Grid named “LayoutRoot” inside your UserControl. 5. If you run your application now, you will see that your Canvas has taken the full screen of your browser window. Why? You didn’t set the Height & Width of your UserControl and placed inside a Grid. That’s why it took the full size of the browser window and that’s why you can see your Green canvas taking the whole screen. 7. If you run your application again, you will see only one Rectangle present inside your Canvas. Which one? Yes, only the orange one. So, there you will ask “We added two Rectangle, one Green and another Orange. But why only the orange one is visible in the UI? What happened to the first rectangle?” So, my answer will be “Nothing happened to any of your added control. They all are placed inside the Canvas”. Yes, that’s right. All the two rectangles are available inside your canvas. As we didn’t specify the position of the rectangles and the second rectangle is bigger than the first one, it placed on top of the other i.e. the orange one placed on top of the green rectangle. Whatever control you add at the end of the Canvas will have a higher Z-Index which places your control on top of the other. I will discuss on this later in this chapter. 8. Now, lets go for positioning the rectangles. We will set coordinate position (50, 50) to the first rectangle and coordinate position (200, 100) to the second rectangle. For doing this, we have to set the Canvas.Left and Canvas.Top properties of each Rectangle. Have a look into the following code. You will understand easily how to do this. <Rectangle x:Name="rectFirst" Fill="Blue" Height="80" Width="120"
<Rectangle x:Name="rectSecond" Fill="Orange" Height="100" Width="150"
10. Now if you want to play around it, just modify your XAML to place the rectangle controls in various positions inside the canvas. I think you are now familiar with positioning silverlight controls inside the Canvas. Let us discuss something on the Z-Index property. Z-Index stands for layering out your Silverlight application. If you are familiar with Photoshop you knew that, photoshop creates layers to position them on top of each other. Those who don’t know about it can learn it from here. Suppose you want to create an application where two rectangles are there (similar to the previous example) and one rectangle is partially blocking the another. You have to write a logic to modify your application such that, when you click on the first rectangle it will come front of the another. Similar kind of logic for the second rectangle too. So, how can we develop this? We have to use the Z-Index property for each rectangle. Lets say we will set the Z-Index of the first rectangle to 1 (one) and the second rectangle to 2 (two). Initially the second rectangle is blocking the first one partially. Now once you click on the first rectangle we will set the Z-Index of it to 2 and the Z-Index of the other rectangle to 1. As the Z-Index of the first rectangle is greater than the second it will come on top of the other. The same behaviour will be for the second rectangle. Once we click on the second rectangle (which is hiding behind the first) will come top the other will go behind. For doing this, we will set the Z-Index of the first rectangle to 1 and the second to 2. 1. Open the CanvasPanelDemo.xaml file and modify the Rectangle properties of Canvas.Left and Canvas.Top to place the rectangle on top of each other. 3. 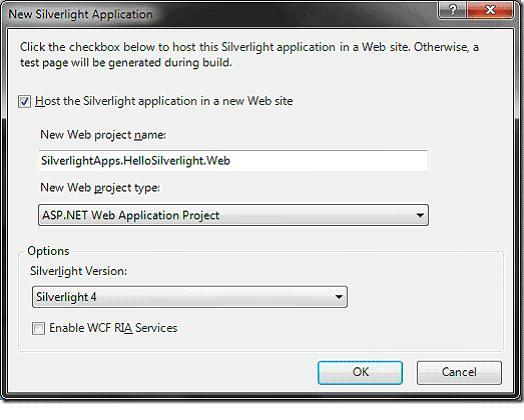 Run your Silverlight application and you will see them in action. You will see the orange rectangle blocking a part of the blue rectangle. 5. Now in the MouseLeftButtonDown event of the first rectangle we will set the ZIndex of the first rectangle to 2 and the second rectangle to 1. This will cause the first rectangle to come on top of the second rectangle. 6. In the MouseLeftButtonDown event of the second rectangle we will set the ZIndex of the first rectangle to 1 and the second rectangle to 2. This will cause the second rectangle to come on top of the first one. 7. Run your application to see it in action. At the initial time the second rectangle will be on top of the first one. When you click on the first rectangle it will come in front. Once you click on the second rectangle the first will go behind and thus the second rectangle will come at the front. StackPanel is one of the most important panel in Silverlight. You will find it useful when you want to show some of your Silvelright elements either Horizontally or Vertically. It has a property called “Orientation”. You can set it appropriately as per your requirement. Once you add some elements inside StackPanel, you will notice that they will place as a Stack on top of each other. Have a look into the following figure to get a clear understanding of the same. 3. Open the StackPanelDemo.xaml file and inside the Grid tag named “LayoutRoot” we will add two StackPanels (one Horizontal and another Vertical) with some Rectangles as Children. 6. Now run your application and you will notice the following UI of your StackPanel Demo application. The left panel is your Vertical StackPanel whereas the right panel is the Horizontal StackPanel. ScrollViewer is another layout container, which you will find interesting in some cases. Though it is not require to use in all the scenarios to hold elements but to show contents inside a scrollable panel like ListBox or Editor window you have to use ScrollViewer. ListBox, TextBox, RichTextBox internally uses ScrollViewer to implement the scrolling functionality. 3. Surround the StackPanel with ScrollViewer tag (<ScrollViewer> … </ScrollViewer>) and set the Height of the ScrollViewer to 200. Also add the Grid.Column = “0” to the ScrollViewer. 5. If you run the application now, you will see a ScrollBar on the right side of the panel. Thus it make your Rectangles to scroll properly. Here note that, we set the Height to the ScrollViewer and not to the StackPanel. The reason behind this is, if you set the Height of the StackPanel it will have a fix height, thus it will not create the Scrolling behaviour. As we set the Height to the ScrollViewer the StackPanel height increases as and when you add child to it but the ScrollViewer here does a great job and creates a scrollbar cropping the StackPanel to the height of the ScrollViewer. It’s an another type of Layout Panel in Silverlight. But as like other panels it can’t contain multiple contents in it. Border supports only one child as a content. If you want to use Border as a container of multiple controls, you have to wrap those with anyother panel like Grid, Canvas etc. and then place it in the Border. So, what is Border actually? The name says it. It is a border. If we want to add some border in our Silverlight application, we can use it at that time. Look into the following figure. Here you will see four different shapes. These shapes you can create using Border element. You can create your border filled with Solid color or Gradient color or you can use a transparent color. After seeing the above figure, I think one question came to you mind that “I can create the same thing using the Rectangle too. Then what is the benefit of using Border?” Yes right. You can create the same thing using Rectangle too as we did earlier, but the main difference is “You can create a rounded corner shape using Border. It has the property called “CornerRadius”. If you set it to 45, means your shape will have a corner radius of 45 degree. 3. 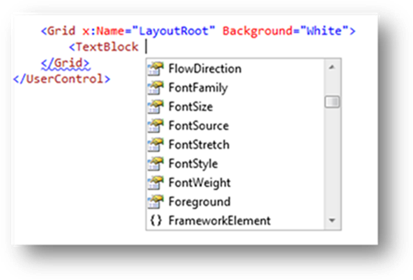 Open the BorderDemo.xaml file and inside the Grid tag named “LayoutRoot” we will add a Border as Content. 7. Let us modify it a little bit more to add a child inside it. We will put a Text “I am a TextBlock inside Border control”. Put the below code in your XAML. You will notice that I placed a TextBlock inside the <Border> … </Border> tag. You can place any control or panel inside the Border like this. <TextBlock Text="I am a TextBlock inside Border control"
Remember that, you can add only one child to the Border panel. If you need to add more than one child, add a different panel like Grid, Canvas or StackPanel inside the Border and then add the child elements to that panel. Think before chosing your panels. ViewBox panel is another useful panel in Silverlight. It is actually not a new panel in Silverlight. It was available in Silverlight 3 toolkit, but Microsoft added it in the Silverlight 4 runtime for it’s demand. You can use ViewBox panel to stretch and scale a element control. Like Border it also has only and only one child. If you want to set more than one child, you have to use any other panel inside the ViewBox to hold other children controls. If you set the Stretch property to Fill, the content will fill the entire space of the ViewBox. It doesn’t preserve the aspect ratio. If you set the Stretch property to None, the content will preserve its original size. If you set the Stretch property to Uniform, the content will resize to fit the ViewBox. The ViewBox will take as much space as require to show the entire content and also preserves the aspect ratio. If you set the Stretch property to UniformToFill, the content will resize to fill the destination dimension. If the original size differs than the aspect ratio of the ViewBox, the content is then clipped to fit the ViewBox dimension. 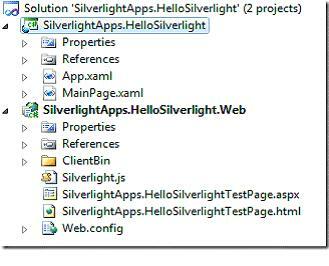 Silverlight 4 provides a large collection of UI controls for Silverlight application development. These controls are require to do the UI design of the application for giving a better representation to the user. You can customize the look & feel by creating your own Style or extending the control to give more power to the UI. I will describe the control styling in later chapters. 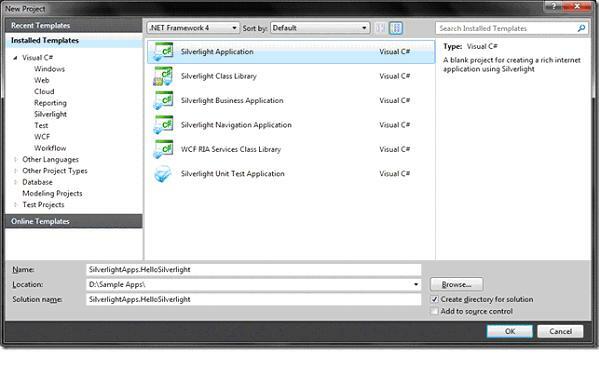 TextBlock is the primary element for displaying text inside your Silverlight Application. You will find it useful whenever you want to display some strings. TextBlock is a FrameworkElement available in the System.Windows.Controls namespace. There is a property named “Text” where you have to enter the text string. This is not necessary for you to use the Text property to set some text inside your TextBlock control. TextBlock control can also be used as a container to set a para of strings. Hard enter to place a line break can be set using the <LineBreak/> control. This is the second line of Text. 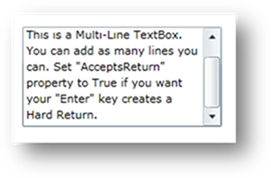 You will see various Properties and Events available for TextBlock control to do text formatting and other operation. 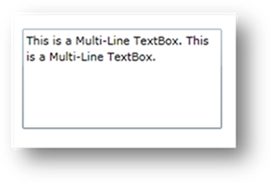 TextBox is another important element in Silverlight. It is also available inside the System.Windows.Controls. Unlike TextBlock, the TextBox inherits from the base class Control. 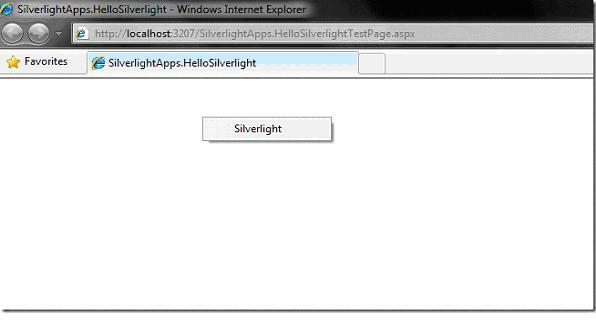 Whenever you want to enter some text inputs from your user using your Silverlight application, you need the help of TextBox. 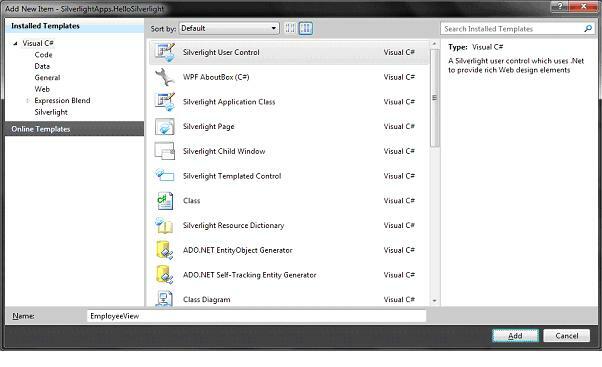 It is one of the most important input control for Silverlight for data entry. Set “IsReadOnly” to True if you want your TextBox as only readable by your user. This is very useful when you are putting a Edit Button near your TextBox to give the user chose whether he wants to update some texts. Set “MaxLength” to a positive numeric value , your user can’t add more than the specified value. Suppose you are setting it to 50, hence after inserting 50 characters the TextBox caret will not go forward. “TextAlignment” is responsible to set the text alignment to left, right, center or justify. “Text” property contains the Text entered into the TextBox. You can set it in the same way from XAML & Code as I mentioned above. Set “TextWrapping” to Wrap so that, if your entered text becomes longer than the specified width of the TextBox, it will populate the remaining text in a separate line (as described in the MultiLineTextBox figure). PasswordBox is available inside the System.Windows.Controls and inherits from Control. Whenever you need to add a Password field in your Silverlight application form to give the user access to login with credential, you have to use this password box. You will find it useful when you need to do login. Sets the password character of the control. The default value for password character of the field box is the asterisk (*). But you can change it by setting the value to this dependency property. If you set ‘X ‘ as password character, whatever you enter in the textbox of the field will display as ‘X’. Gets or Sets the password property of the PasswordBox. If you set the text it will be visible in the UI in asterisk format. “SelectionBackground” color once set, your selected text will have the specified background. Like “SelectionBackground” the “SelectionForeground” will set the specified color as the foreground color of the selected text. Like TextBoxRichTextBox also inherits from Control and available in the namespace System.Windows.Controls. It is useful when you want to give a input box to your user where they can able to format the entered text like word processor. You can display text in various text format like Bold, Italic, Underline, Left/Right/Center align, various font size/color etc. Have a look into the following XAML code where the RichTextBox has several <Paragraph> tag to split the text in various parts. You can use <Bold>,<Italic> tags to format the entered text. You can also align the text or change the font-size or font-color by setting the proper attributes to the <Paragraph> tag. This is a RichTextBox control having multiple paragraphs inside it. 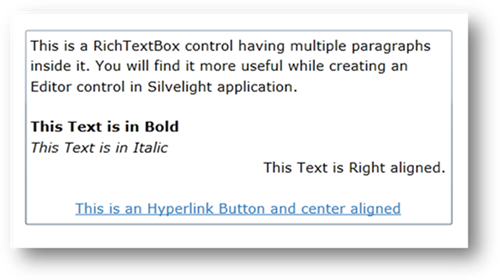 You can see here that, not only formatted text you can also enter hyperlinks to the RichTextBox control. If you set the AcceptsReturn=”True” your user can explicitly enter hard line break by pressing the “Enter” key. ComboBox is an items control which works like a ListBox but only one item is visible at a time. It inherits from Selector control and available in the System.Windows.Controls namespace. It contains ComboBoxItem which inherits from ListBoxItem. ComboBoxItem is also present in the same namespace as ComboBox is i.e. System.Windows.Controls namespace. Let us create a simple ComboBox having some contents inside it. Set the Width of the ComboBox to a specific value, let’s say 200 in our case. Now add ComboBoxItem as the Items of the Combo. This step is not always require (in case of XAML atleast). Set some string as the “Content” of the ComboBoxItem. Here you may ask one question, is it only supports text? The answer is “No”. You can also set any FrameworkElement inside the Content of the ComboBoxItem, such as TextBlock, TextBox, Button, Rectangle etc. Once set to True the drop down will show with the content. By using this property you can programmatically control the visibility of the dropped menu. By default it is set to False and when you click on the small arrow it sets it to True and thus it opens up in the screen. From the name you can easily understand the functionality of this property. By default it is set as False. Hence, in the normal scenario you can’t type anything inside the ComboBox. If you want to edit the content of the ComboBox or want to type inside it, just set the value to True. You can control the size of the drop down menu. If you set it to some numeric value, the height will be set as per the entered value. Gets or Sets the Selection Behaviour of ListBox control. 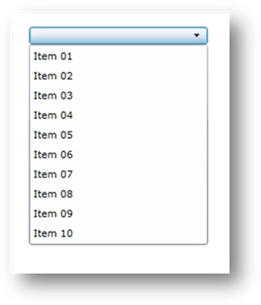 There are three different modes of the Selection of the ListBoxItem: Single, where user can select only one ListBoxItem at a time; Multiple, where user can select multiple items without pressing a Modifier Key; Extended, where user can select multiple items by pressing a Modifier Key. The default mode is “Single”. The above example shows you how the ListBox looks like in different SelectionMode. The first example demonstrates “Multiple Selection Mode”. This type of listbox you need to give your user a choice to select multiple items. In the second example shows a simple “Single Selection Mode”, where the user can only select a single choice. 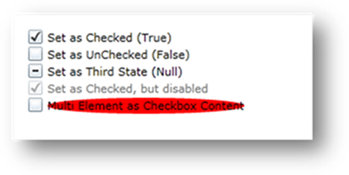 Checkbox inherits from ToggleButton and resides inside System.Windows.Controls namespace. Using this you can give your user a choice to select multiple items. There are three different states for CheckBox. If checked will return true, unchecked will return false and the third state returns null value. Generally the third state is not that much useful in normal scenarios. Use “Content” to set value (e.g. string, rectangle etc) to the checkbox. The first code demonstrates the Checked item, the second code demonstrates unchecked item and third code demonstrates the third state. Third states becomes null. In the fourth code you will see the disabled state of the checkbox. What about the fifth code? Yup, in the fifth code we have added a Ellipse and a TextBlock wrapped with a Grid panel. It is not always necessary to set string as content. As per your requirement you can set anything. But be sure that CheckBox.Content only supports a single element and if you want to set multiple elements wrap with a panel as I demonstrated above. Like CheckBox the element name RadioButton placed inside System.Windows.Controls assembly namespace also inherits from ToggleButton and contains the same properties as described above in CheckBox examples. Normally if you are setting multiple radio buttons inside a page, you can select only one of them. If you need your user to select radio button from each different group of your option you can set a group name to the radio button. By grouping the options using a group name will allow your user to select a single radio option from each group. Button control in Silverlight inherits from ButtonBase class and can be found under the System.Windows.Controls namespace. Button controls are mainly require to Submit forms or for navigation panels. You can style it as per your need. You can set some text as it’s content or can place any framework element inside it. If you want to add more than one element inside it, you have to use any panel wrapped to your elements. The first example is a simple button control whereas the second contains checkbox as it’s content. The third example contains a Rectangle and a Text wrapped by Grid panel. This shows how we can use panel to load multiple elements inside a button. Button has Click event where you can write your logic to do whatever you want once you click on the button e.g. navigation to a different view, submitting the form etc. Are you trying to make money from your websites or blogs by popup advertisments? If so, have you considered using Propeller Ads? sudheer reddy. Watermark theme. Powered by Blogger.